Okay, that’s interesting (and there’s a whole table at the link), but there’s a key point being missed here: Just because something isn’t partisan doesn’t mean it’s not divisive. The argument being made is that you can tell how divisive a bill is by subtracting the percentage of Republicans who support it from the percentage of Democrats who support it. So Obamacare gets an astounding 93.5% score — almost every Democrat supported it, and no Republicans did so. But it’s possible to be divisive without having such a partisan split. For example, let’s look at the Civil Rights Act of 1964. 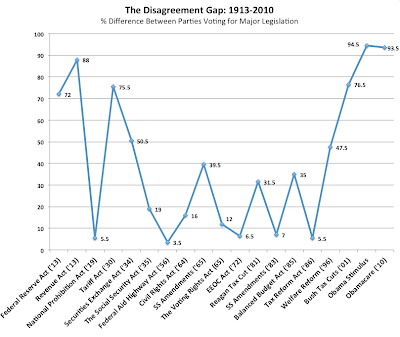 According to Thompson’s graph, there’s only a “disagreement gap” of 16% — the model of comity. But that tells us little about the bill and a great deal about what the mid-20th century parties looked like. Both parties contained liberals and conservatives. Little separated the two parties, but a great deal divided them internally — particularly civil rights. Look at the roll call vote. Nearly every Representative from every former Confederate state voted no, while virtually every member from a non-Confederate state voted aye. That’s really divisive! It’s just not partisan, given how the parties of the day were organized. It’s pretty much the same story with the Voting Rights Act of 1965. In fact, the general shape of the data in the graph above — high polarization leading to de-polarization leading to re-polarization — is the same thing we see in many indicators of legislative partisanship in the Congress. (See here, for example.) All it’s telling us is that the parties were internally divided for a while on matters of race and now have re-sorted themselves. Now, one could dismiss this disagreement as being just about semantics. But the semantics in this case are important. 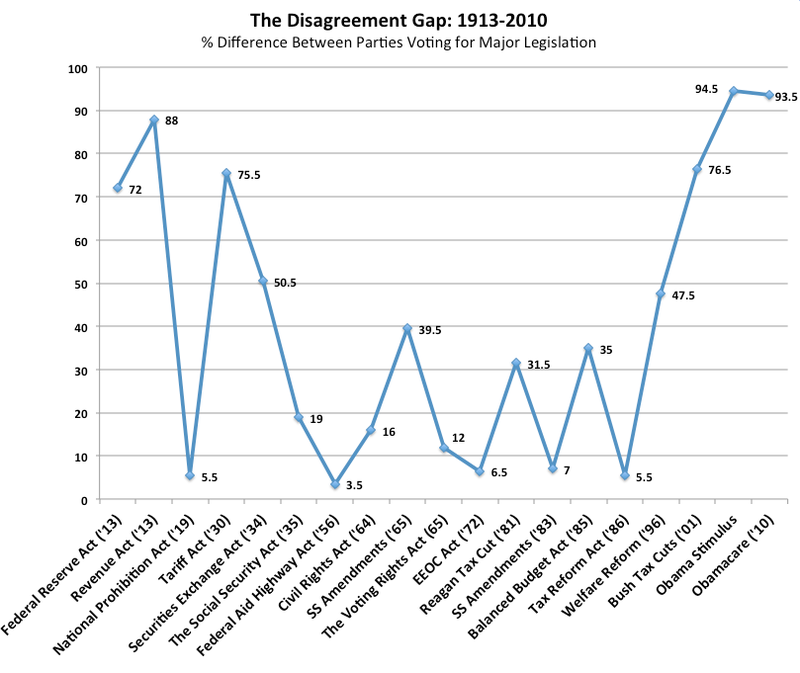 As Thompson says, “In the last 100 years, no major lasting legislation has passed over 100 percent opposition from the other party. Until Obamacare.” That could be (and most likely will be) interpreted as somehow delegitimizing Obamacare, making efforts to repeal it seem somewhat more temperate than they may actually be. In fact, these are the kind of votes you’re going to get when you try to pass something substantive in a period of strong polarization. It’s not about the bill; it’s about the times we live in.